There are times I genuinely feel sorry for teenagers these days. Usually a lot of people grumble about all the new electronics that kids get to use, that they never got to have as kids. Personally, I really have no desire to be a kid in this day and age. When you’re in high school you’re going to cause a certain amount of mischief. I was one of the many that enjoyed driving fast down back roads. Had my parents had this device I’d have never had any fun. Now that being said, it’s an awesome day and age to help parents make sure their kids aren’t up to anything. 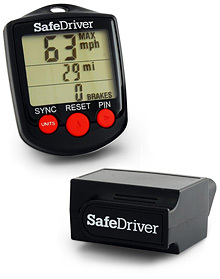 This SafeDriver Wireless Vehicle Monitor is easy to install and has a tamper-proof pin number. The device records the highest speed traveled on their trip, plus it keeps track of any sudden braking. It’ll also let you know the distance traveled, so you know if they did any extra driving that they weren’t supposed to be doing. You can purchase it for $69.99 through Think Geek.